Ride a bike? 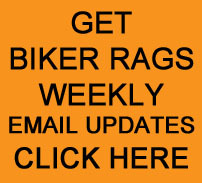 Head to Biker Rags! 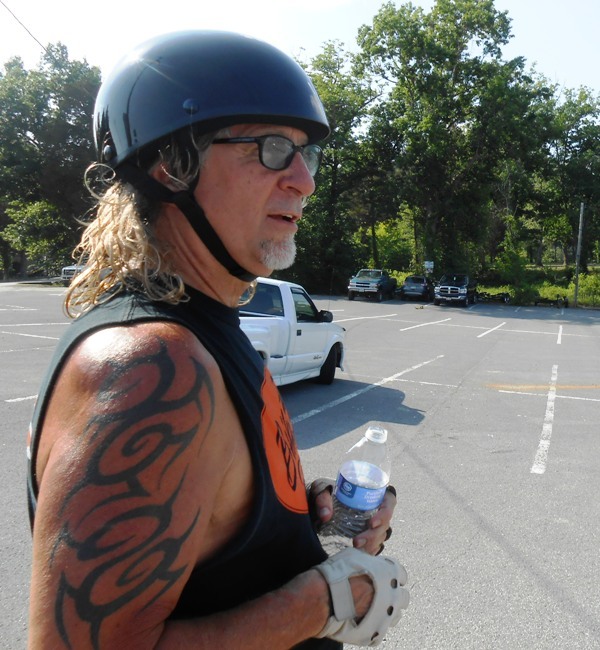 On Tuesday, June 17th, we took a Day Ride. 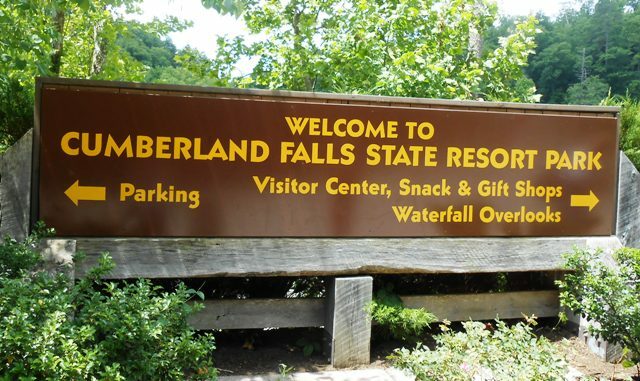 Our destination was Cumberland Falls State Park in south east Kentucky. We left our home in North Knoxville at 9:45am. We had blue skies and a warm day ahead. We rode north on Clinton Highway taking us through Clinton and north into Lake City. In Lake City, we stopped at Weigel’s for fuel and a quick snack. 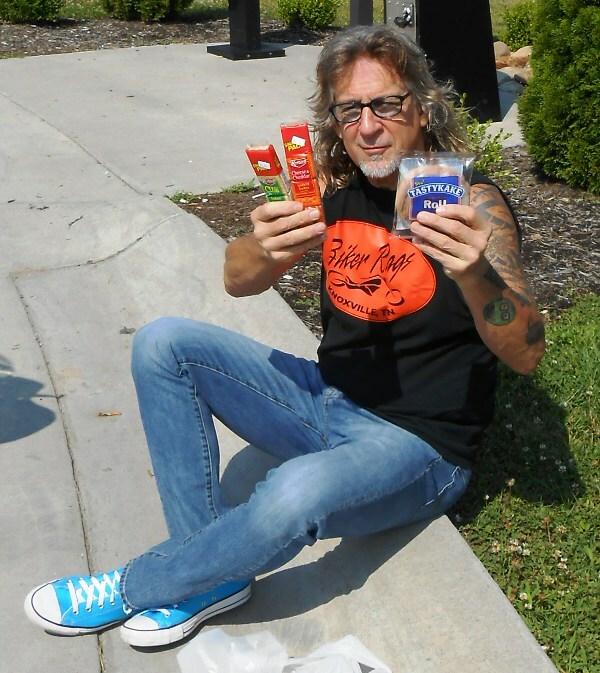 We got snacks for now and later in the trip. 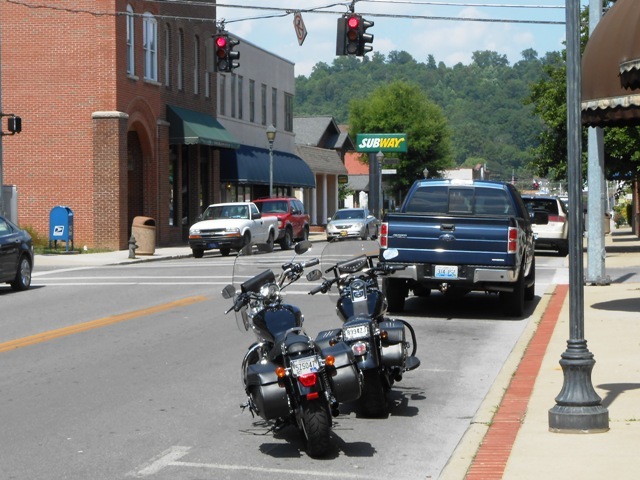 From Lake City, we rode north on 25W through Caryville and on into LaFollette. 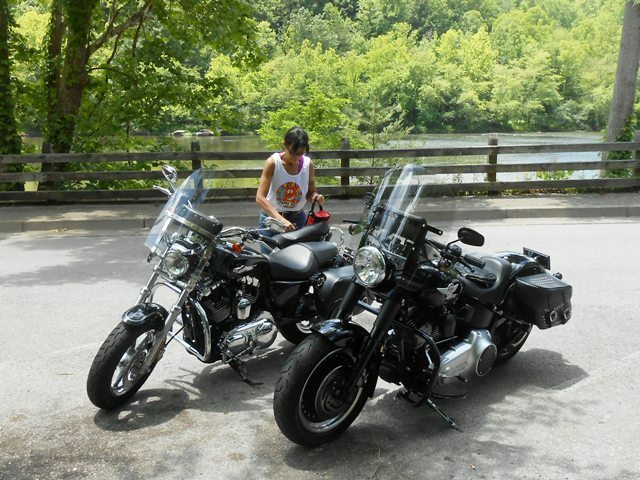 We stayed on 25W riding north toward Jellico. 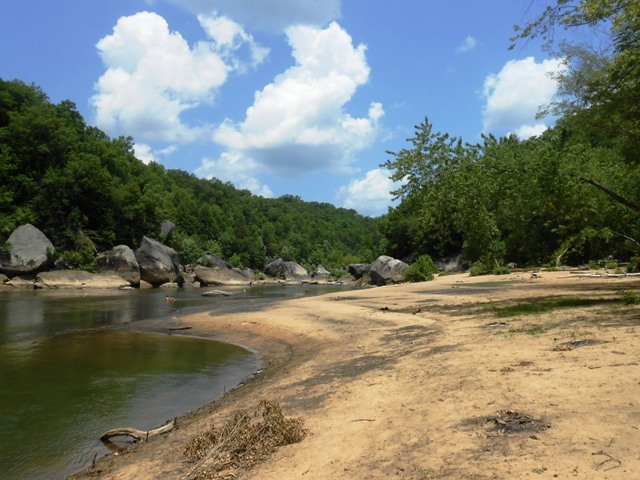 We stopped along the way to try and capture the beauty of the rising rock formations. Pamo looking up at the rock wall along 25W. Close up of the massive rock wall. 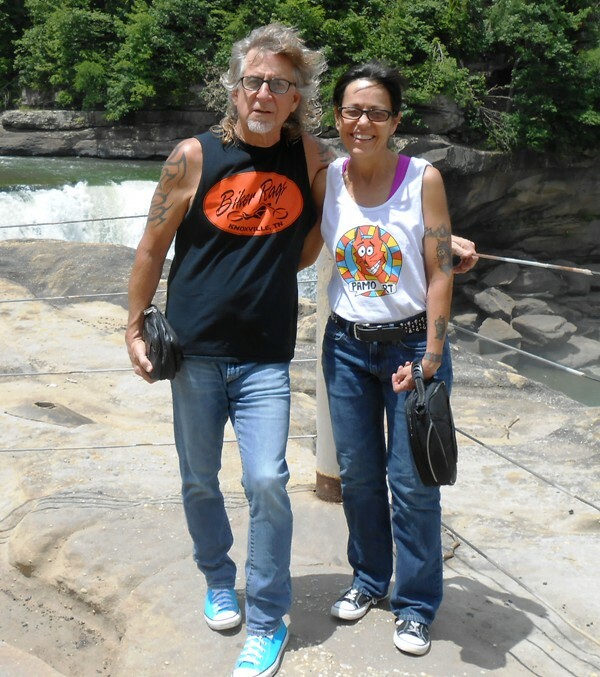 Another park visitor kindly took our photo at the top of the falls. 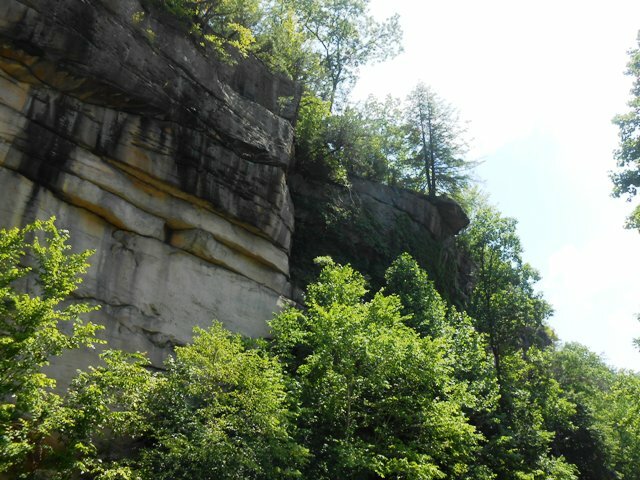 View opposite the falls. 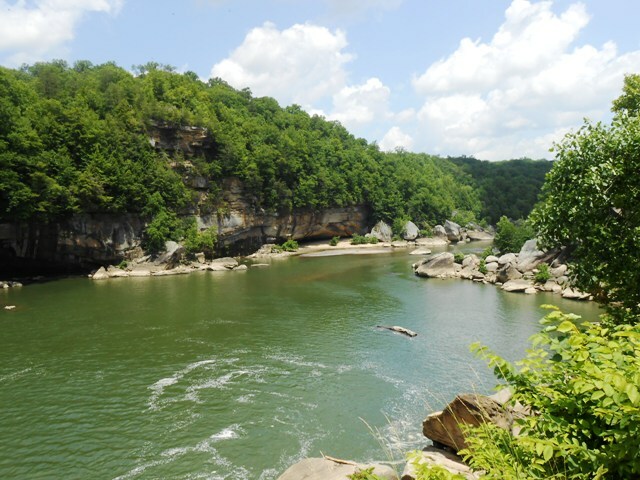 This was from the top of the falls. We walked down to the lower viewing area. 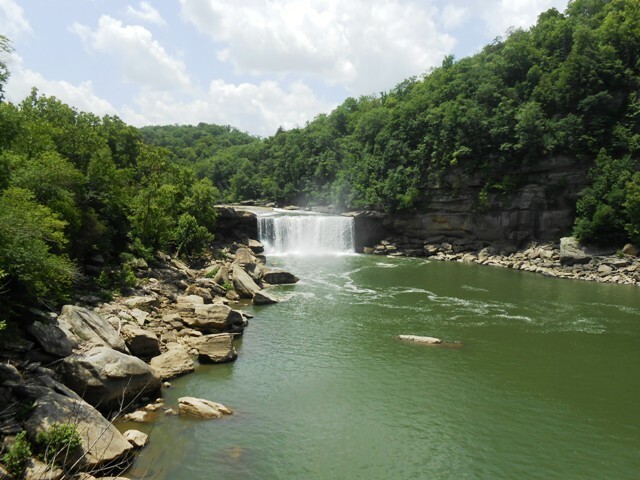 The walk was worth the gorgeous view of the falls! We walked to yet another viewing area. 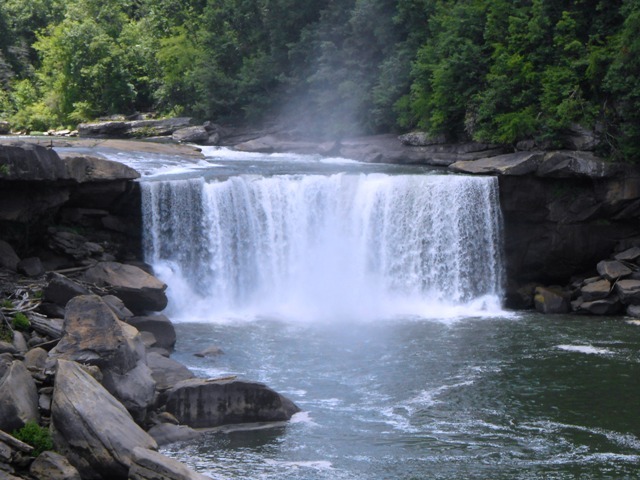 Another view of the falls. 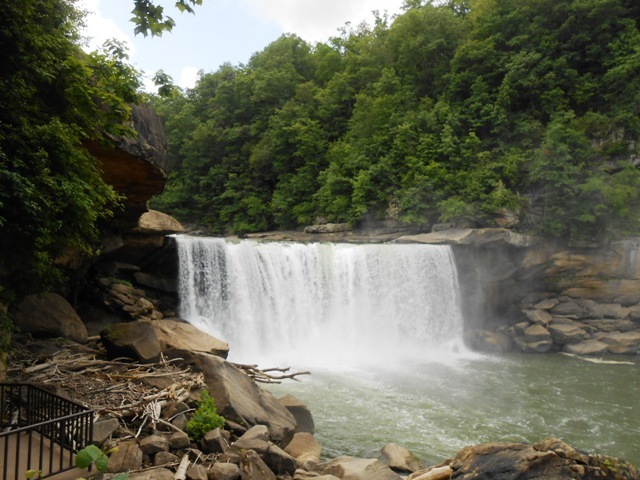 Long view of the falls. Then we walked down to a much lower view. We arrived down on the beach. 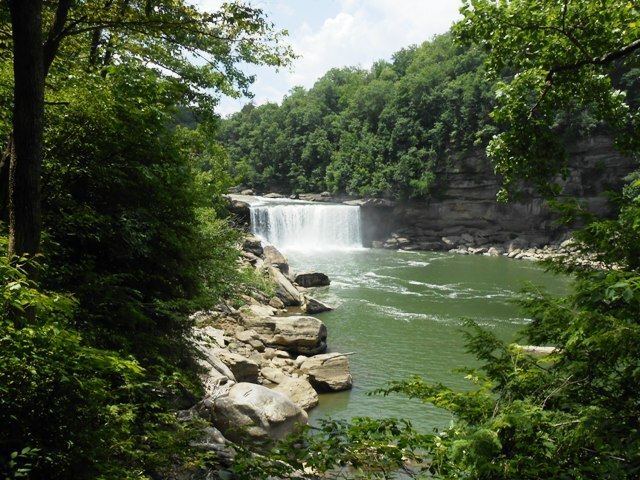 View of the falls from the beach. After walking around for about an hour, we headed back to the bikes to continue on our way. 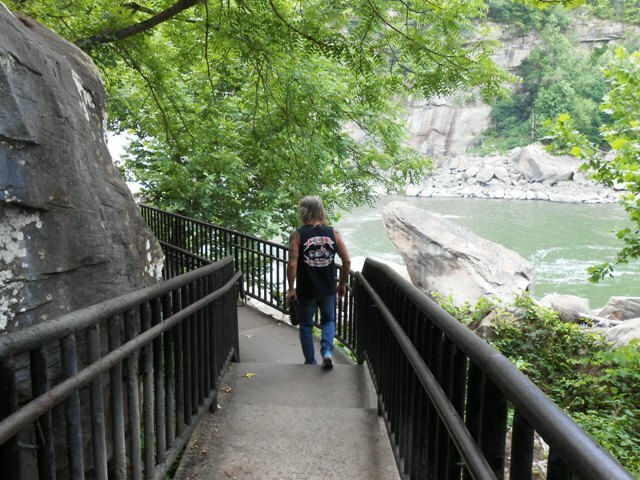 Preparing to leave out from Cumberland Falls Park. 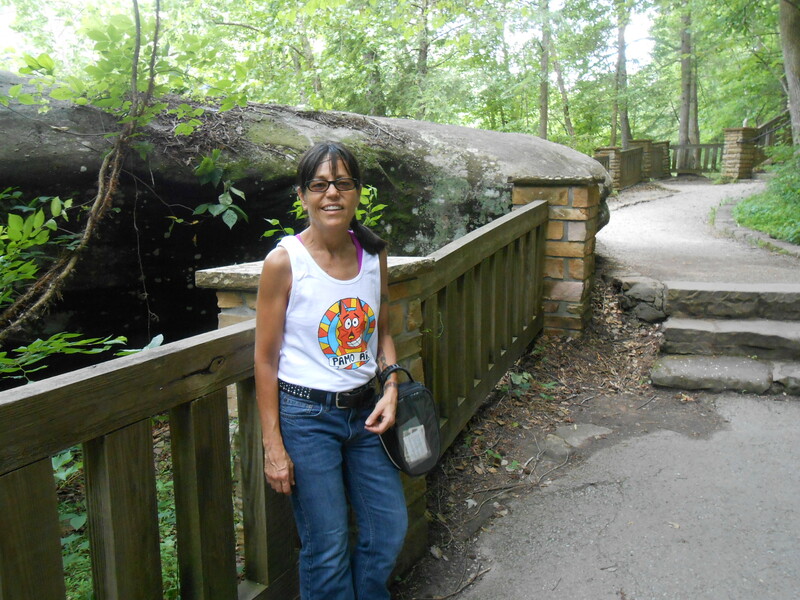 After our visit at the Falls, we got back on 90 and then back to 25W. At 25W, we rode north about 20 miles and on into Corbin. 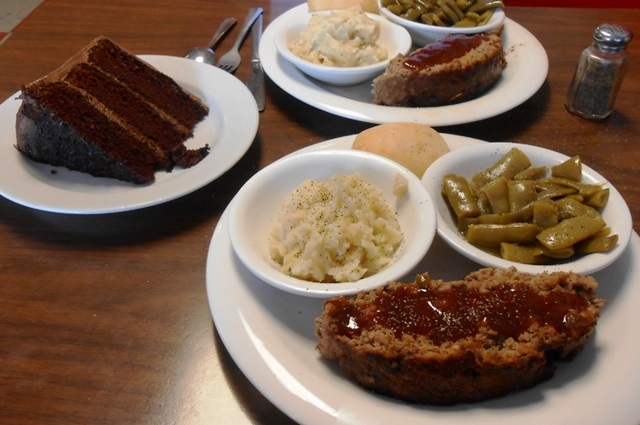 Right in downtown Corbin, we stopped to eat at The Dixie Cafe. 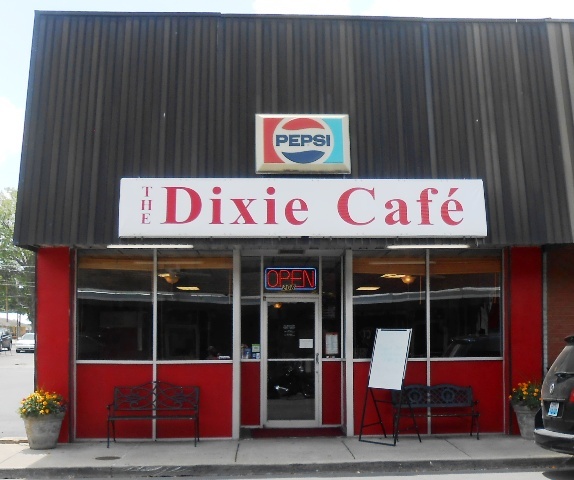 The Dixie Cafe is located in downtown Corbin, Kentucky. 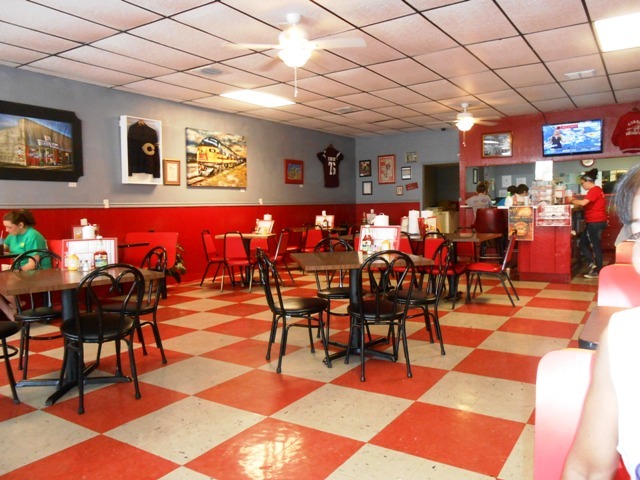 The interior has a fun fifties diner feel. Our waitress was fantastic! And the food was delicious! Absolutely FANTASTIC food. 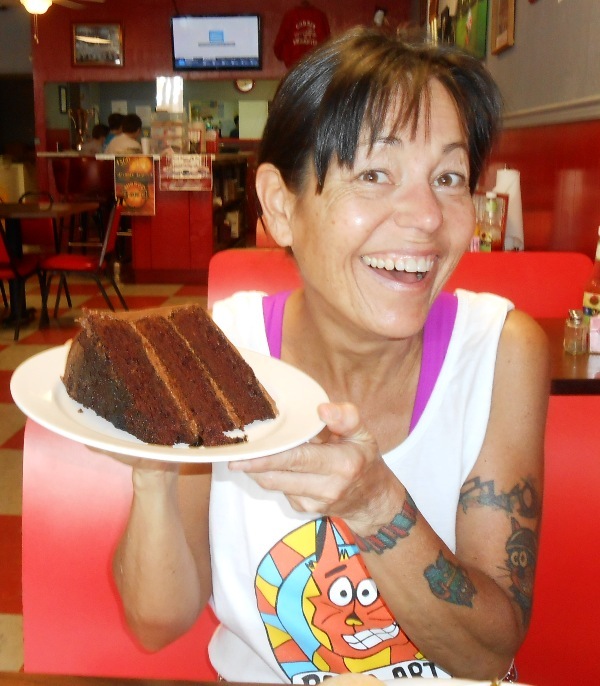 BEST 3 layer chocolate cake in the entire universe… right at The Dixie Cafe! 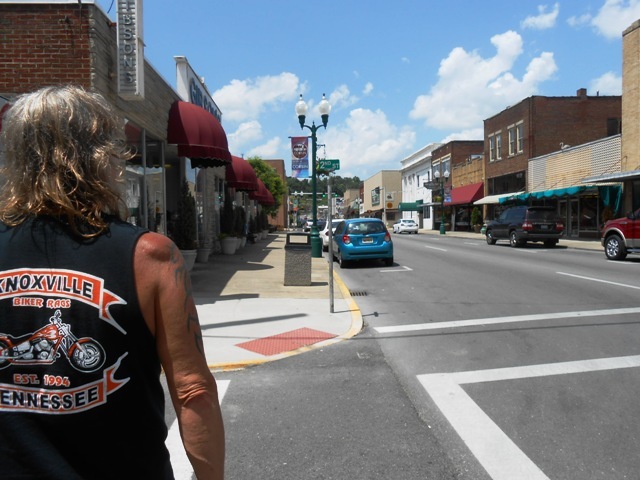 After lunch we walked around downtown Corbin. 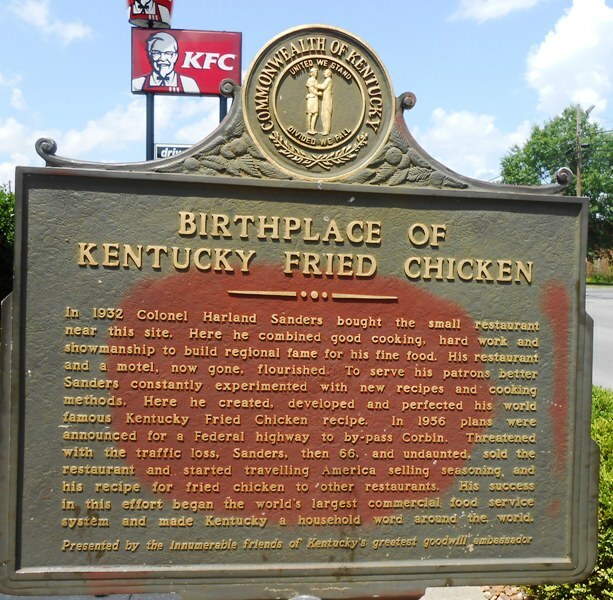 We then rode into North Corbin to visit the Kentucky Fried Chicken Museum- the original Sanders Cafe where the Colonel started his restaurant. 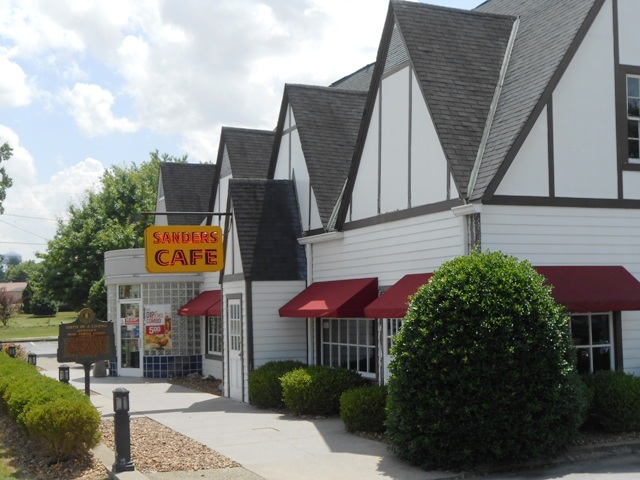 The Sanders Cafe Museum with attached modern day Kentucky Fried Chicken. 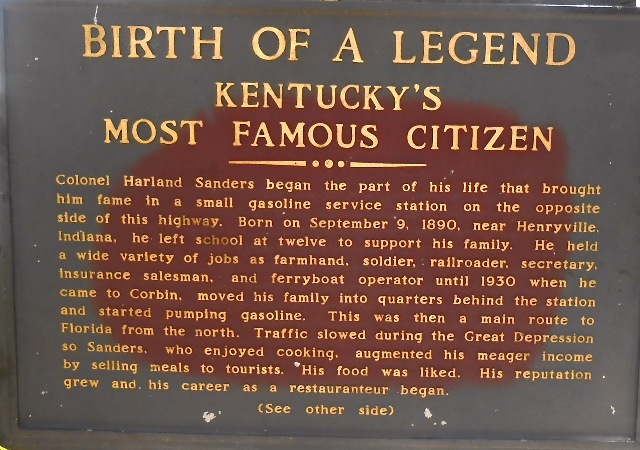 Opposite side of the plaque. 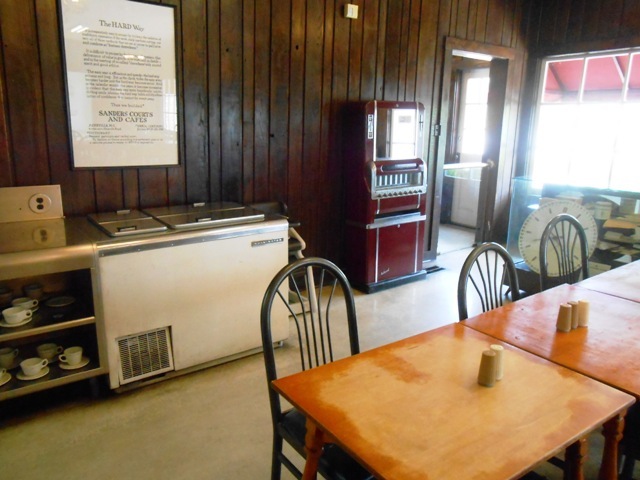 Dining room of the old Sanders Cafe. 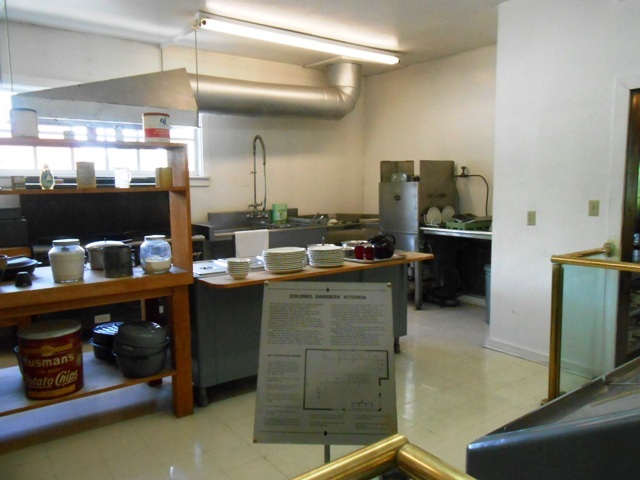 View of the Sanders kitchen. 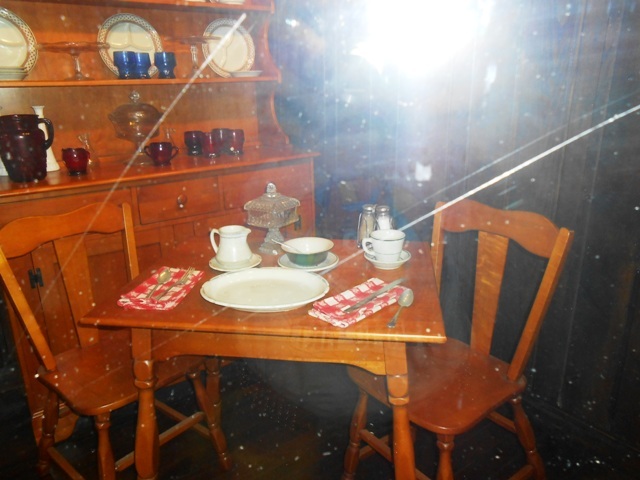 Original Sanders Cafe dining furniture from the 1940’s. 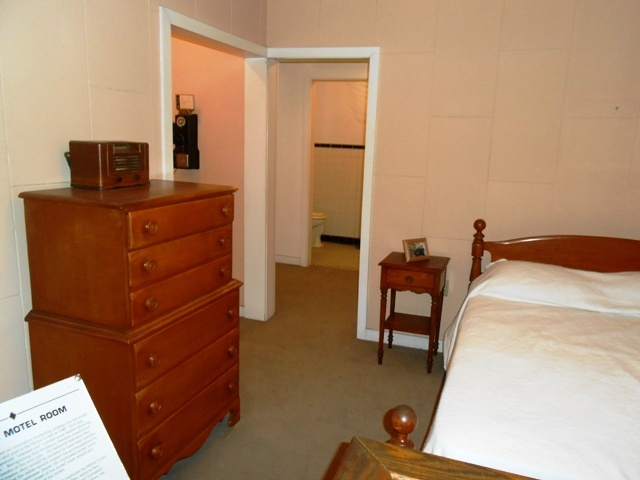 View of Sanders model motel room. 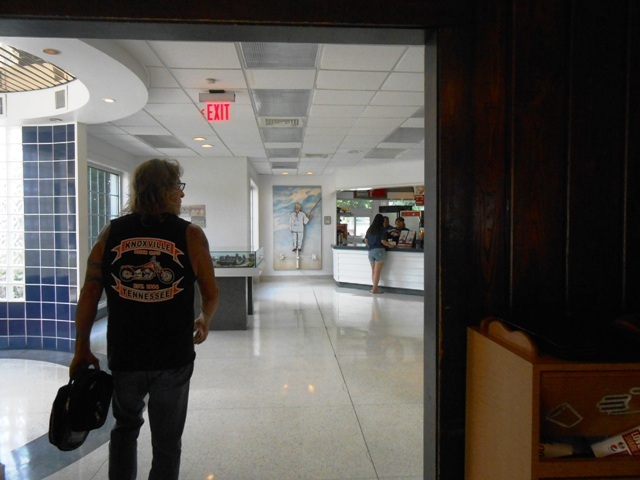 Jeff walking from the old section into the new Kentucky Fried Chicken. 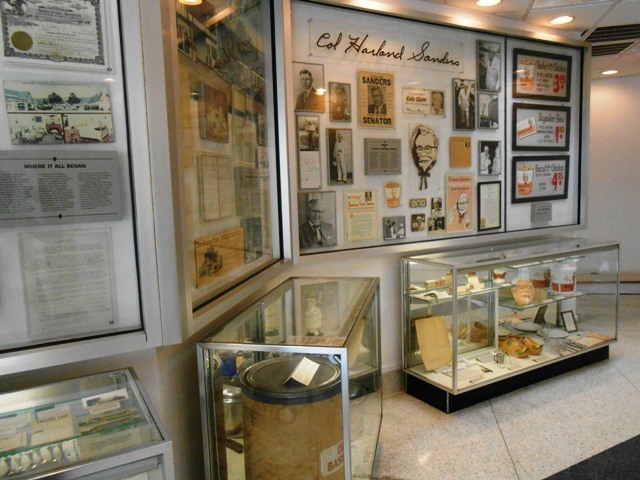 More history inside the new section. 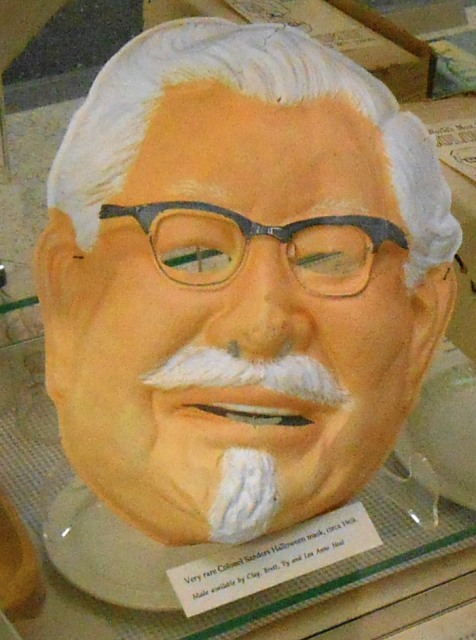 See this Colonel Sanders Halloween mask from 1969? Pamo wore one just like it in 1969 for Halloween! She was seven years old. 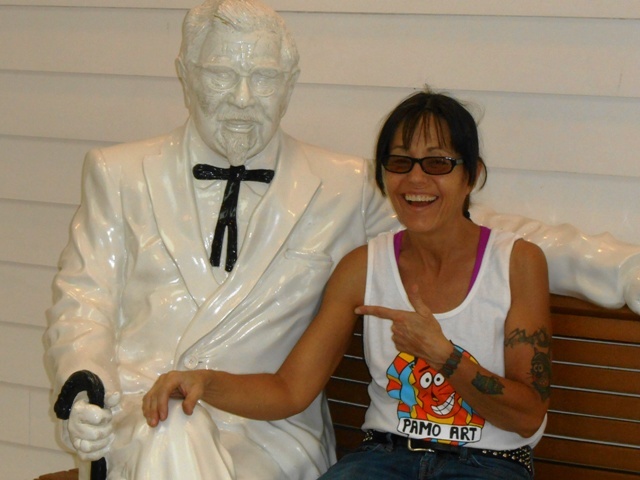 Pamo relives her former Halloween memory with the Colonel. 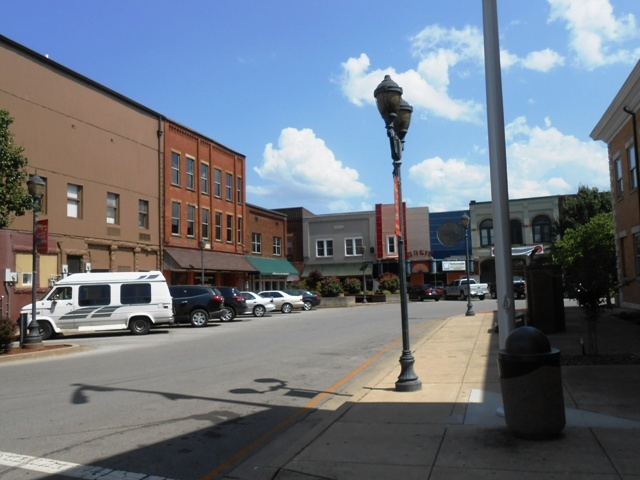 After leaving the museum, we took 25E south to Barbourville. We rode downtown and stopped briefly. We then continued on 25E to Pineville and onto Middlesboro. 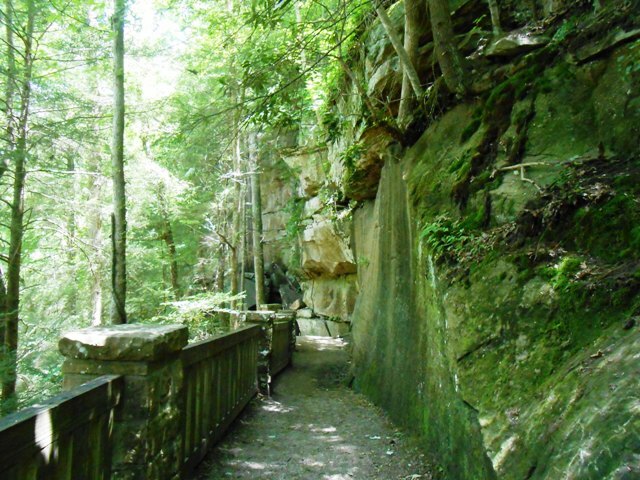 We rode through the Cumberland Gap tunnel to Harrogate. 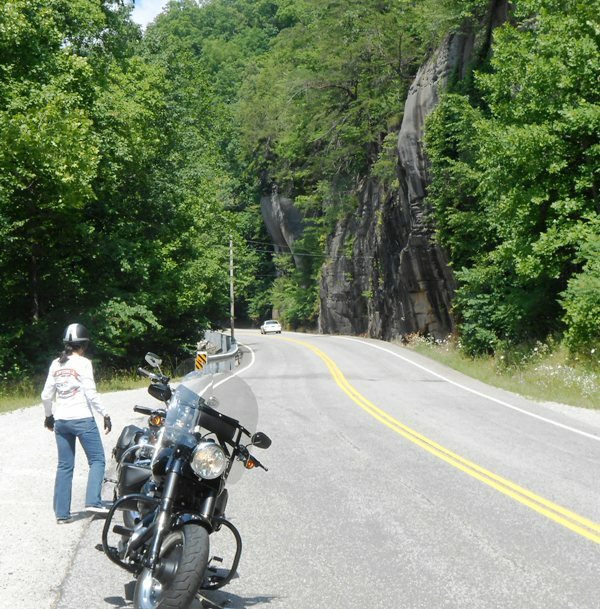 We then rode south to Tazewell and took 33 south through Maynardville. We stopped briefly at the marina for a quick break. 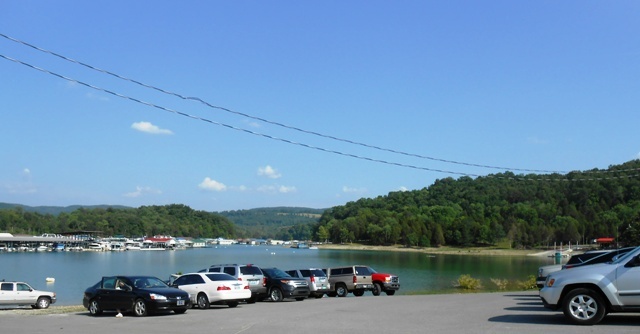 Longer view of the marina. Jeff says it’s been a GREAT day! 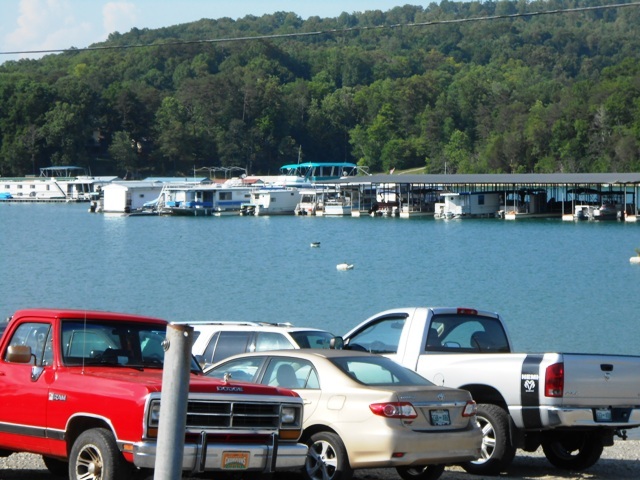 After our break at the marina, we continued on 33 south into Knoxville. We left our home at 9:45am and returned at 6:15pm. Our total ride was 221 miles. You can see our entire list of Day Rides HERE. 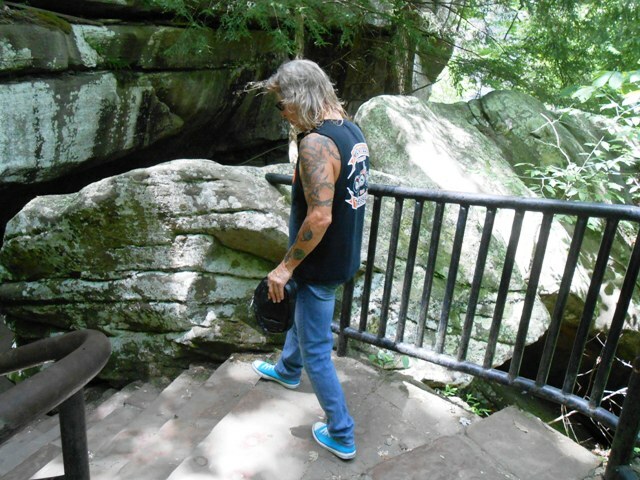 This entry was posted in Day Ride and tagged Biker Rags, Corbin Kentucky, Cumberland Falls State Park, Day Ride, The Dixie Cafe. Bookmark the permalink.